Do you want to live healthier and lose weight without wasting time and money on elaborate ingredients and costly meals? 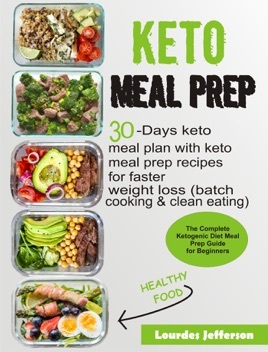 Do you want to reach ketosis and be sustained in ketosis with practical and easy-to-make ketogenic meal prep recipes? If your answer is YES, THEN THIS BOOK IS FOR YOU! This book is a practical guide to keto meal prepping that will help you achieve your dreams of having optimal mental health, a healthy body with rapid and sustained weight loss. In this book, you will find: useful ketogenic meal prep HACKS, TIPS and a COMPLETE BEGINNER'S KICKSTART GUIDE to help you get started with keto meal prepping with several delicious KETOGENIC MEAL PREP RECIPES that will keep you sustained on your weekly cycle. Each of the recipes in this book have been written with nutritional information and servings to help you keep tabs on your macros. You will also find A COMPLETE 30-DAY MEAL PLAN to help you exploit the benefits of the ketogenic diet. Start keto meal prepping today, live healthy, lose excess weight and live longer! Should divide the days in weeks with a grocery list so when those days come I have all the ingredients. But I’m afraid if I by something just for that one meal , it’s going to go to waste .